Henrik has worked as an expedition leader and guide in both the Arctic and Antarctic since 1998. He has lead numerous voyages to Northeast Greenland, Svalbard, the Antarctic Peninsula, Papua New Guinea, along the Norwegian Coast and Scotland. He has travelled extensively to far and remote corners of the world, scaled Andean peaks, trekked in the Himalayas and dived in many exotic locations; but his greatest passion is the Polar region. Henrik and Sue spent three months living and working on the remote Sub-Antarctic island of South Georgia and ten months as dog-sled drivers on Svalbard during the Arctic winter. Most recently Henrik spent 6 month living in the mountains of Norway working as a dog-sled driver. He is truly at home in the world’s wild places. Sue graduated as a veterinary nurse before embarking on a more adventurous life as a professional outdoor guide mainly specialising in the Polar regions. 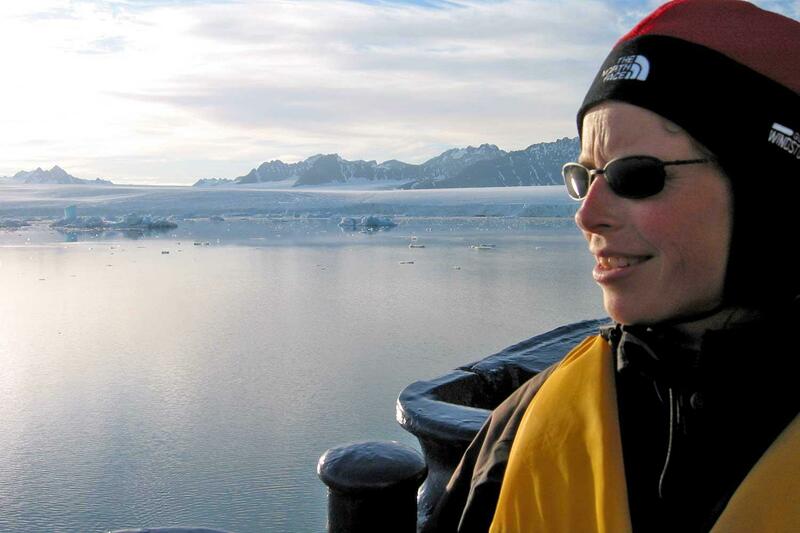 Sue first ventured to the Arctic in 1997 on the Kapitan Klebnikov, completing the Northwest passage, High Canadian Arctic and was part of the first-ever circumnavigation of Baffin Island. Since then Sue has returned to the high Arctic latitudes every year and has spent a winter working in Svalbard as a dog handler and dog sled guide. Sue has a great passion for the Polar regions with a keen interest in the flora and fauna of the High Arctic. Sue will introduce you to some of the best places the Arctic has to offer. Book before 31 March and save 10%! Quote promocode SJO10 during the booking process. A genuinely small vessel is the best way to explore Svalbard’s magical coastlines in search of wildlife. We are thrilled to invite you to join this unique expedition to the top of the world. Svalbard is teeming with life for only a few months of the year, during the Arctic summer. Armed with our “secret weapon” M/S Sjøveien and 24 hours of daylight, just imagine – with a ship like this, we can go to places and see things that bigger ships will never do! Her compact size, shallow draft and only twelve guests on board, we will have the advantage of great flexibility, the perfect recipe for an amazing adventure. The itinerary below is just a sample of what we may encounter once we cast-off at Longyearbyen. The real joy of being on M/S Sjøveien is the prospect of unforeseen wildlife encounters or of chance visits to rarely seen corners of the archipelago. Day 1 - Longyearbyen A day of leisure in Longyearbyen then at 16.00 we will all meet at the pier and board the ship. In the early evening we will head out into the magnificent Isfjorden, probably escorted by northern fulmar and Atlantic puffins. During the night we sail northwards through Forlandsundet, a narrow body of water between Prins Karls Forland and Spitsbergen. Days 2 to 9 - Northwest Spitsbergen In the morning we will make our first excursion in the north west corner of Spitsbergen. We will navigate the narrows of Fuglefjorden and explore the labyrinth of tiny islands set amongst towering peaks and glaciers. We can expect to see little auks and Atlantic puffins flying around the vessel as we cruise these tranquil waters. 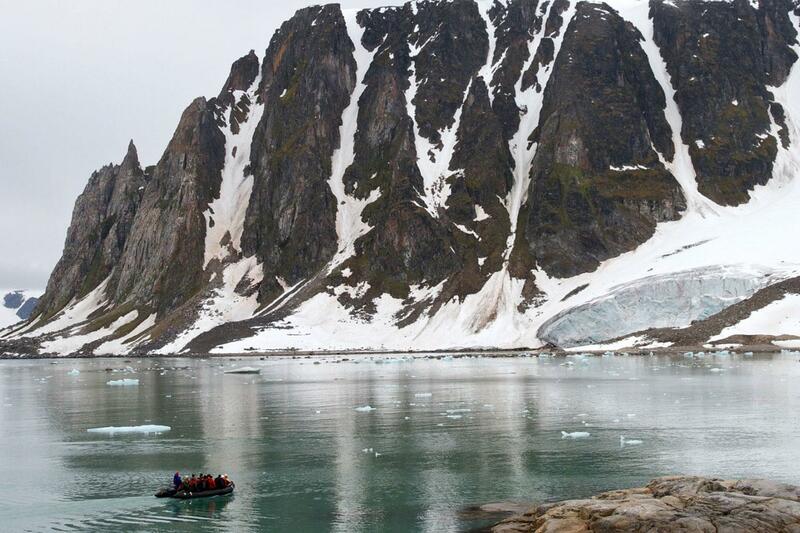 Later we sail to Raudfjord on the North coast of West Spitsbergen, a beautiful fjord dominated by spectacular glaciers and favoured by ringed and bearded seals. The cliffs and shoreline of Raudfjord also support thriving seabird colonies and surprisingly rich vegetation flourishes in some sheltered places. Woodfjorden – Liefdefjorden Overnight we sail into the photogenic Woodfjorden and towards the mouth of Liefdefjorden to explore the islands of Andøyane. Many common eiders, pink- footed and barnacle geese nest here along with the rare king eider. We hope to sail into Liefdefjorden, cruising along the 5km-long face of the impressive Monaco Glacier. The waters of the glacier front are a favourite feeding spot for thousands of kittiwakes, northern fulmar, ivory gulls, Arctic terns and on previous voyages we have seen polar bears in this area. Alkefjellet – Lomfjord Today we hope to be in the Hinlopen Strait, keeping an ever-watchful eye out for whales, seals, walrus and polar bears. 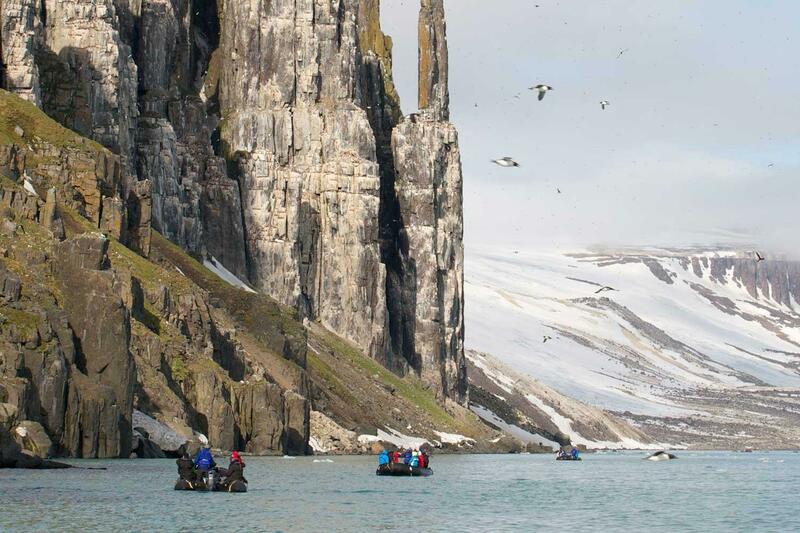 We plan to cruise the towering dolerite bird cliffs of Alkefjellet, home to hundreds of thousands of Brünnich’s guillemots and a place that provides a free meal of eggs to cunning Arctic fox families! On the western side of Hinlopen Strait, we will attempt a landing in Lomfjorden. This is a good place to stretch the legs and explore the beautiful surroundings. We might see reindeer, Arctic fox and ptarmigan and walk across an exquisite tundra garden of many floral species, including varieties of saxifrages, Arctic bell-heather, moss campions and hairy lousewort. Sjuøyane – Phippsøya In the morning we hope to sail via Lågøya, a known haul-out place for walrus. 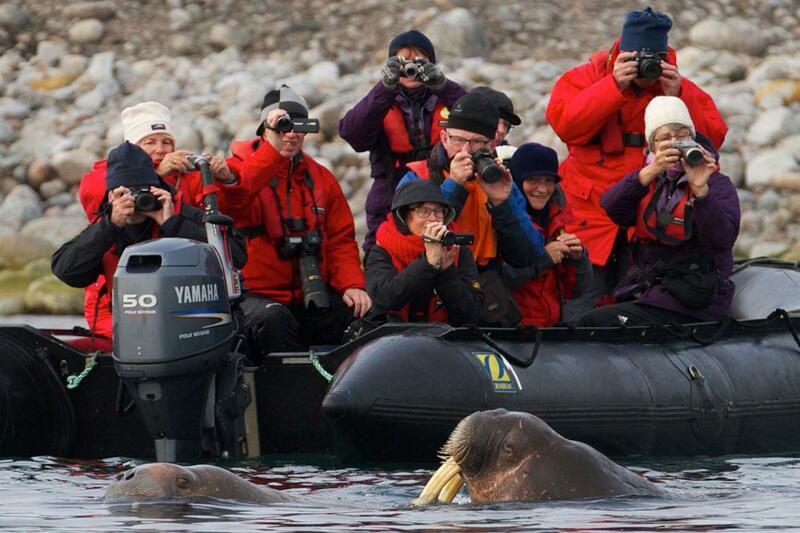 Encountering a walrus haul-out is a moment you won’t forget! 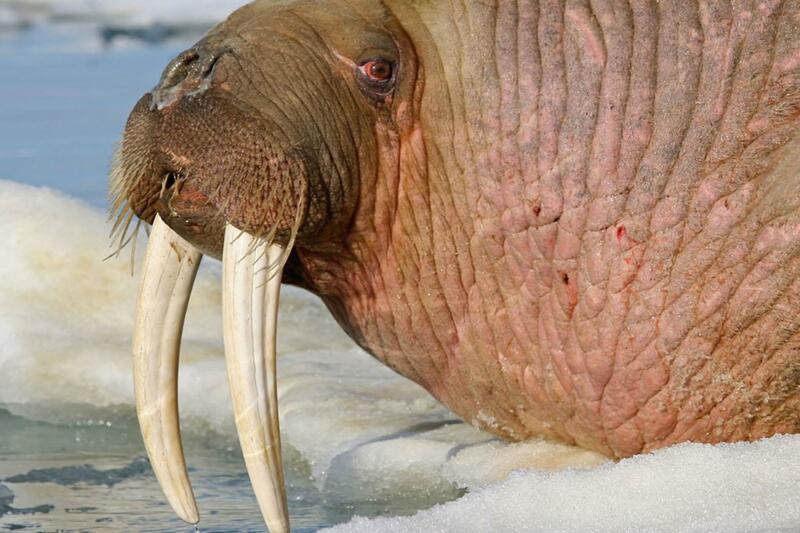 These lumbering giants of the Arctic create a chaotic scene, as each walrus vies for the best spot on the beach. Later we will reach our northernmost point at Phippsøya, in the Seven Islands (Sjuøyane) north of Nordaustlandet. Here we will be above 81 degrees north, just 540 miles from the geographic North Pole. 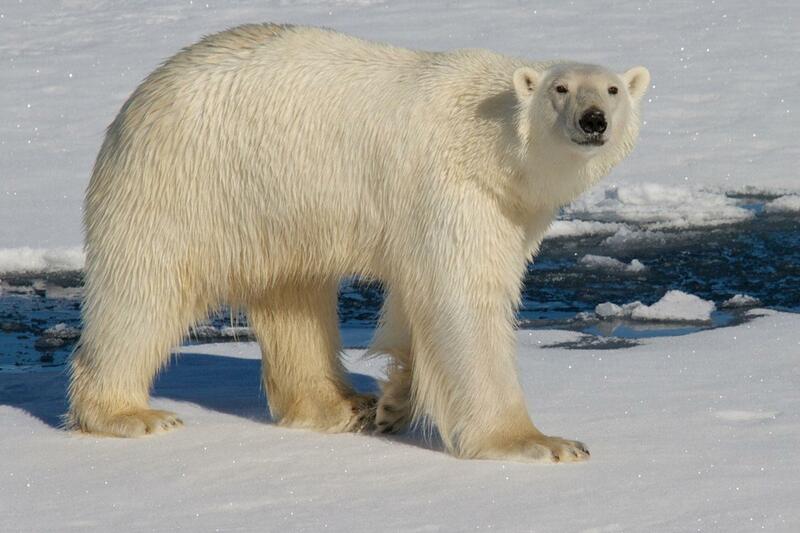 Polar bears inhabit this region, along with the walrus. 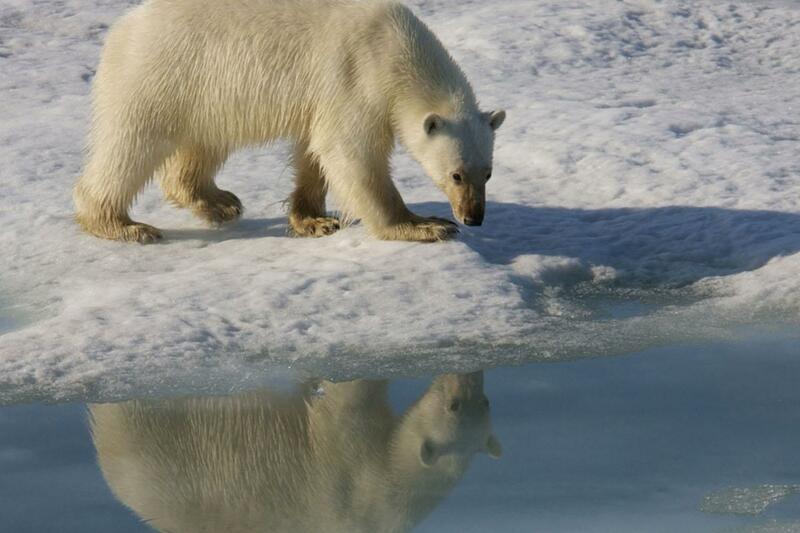 We love to cruise through the pack-ice for several hours looking for polar bear and other wildlife. Nordaustlandet Depending on the ice situation, we will try to head south-east to explore one of the deep fjords at the top of Nordaustlandet. It is the second largest island in the Svalbard archipelago and is covered by the world’s third largest ice sheet. Around the fringe of the ice cap there is a remarkable polar desert. This freshly eroded landscape, carved by severe frost and glacial activity over several ice ages is a geologists paradise, rich in fossils. Pack-Ice cruising Retracing our route westwards, we plan to sail through and along the pack-ice edge, always on the watch for the mighty polar bear, seals and other wildlife such as the rare Greenland (bowhead) whale. Day 10 - West Spitsbergen We sail into St. Johns Fjord, or head further south to the mouth of Isfjorden and land at Alkhornet. 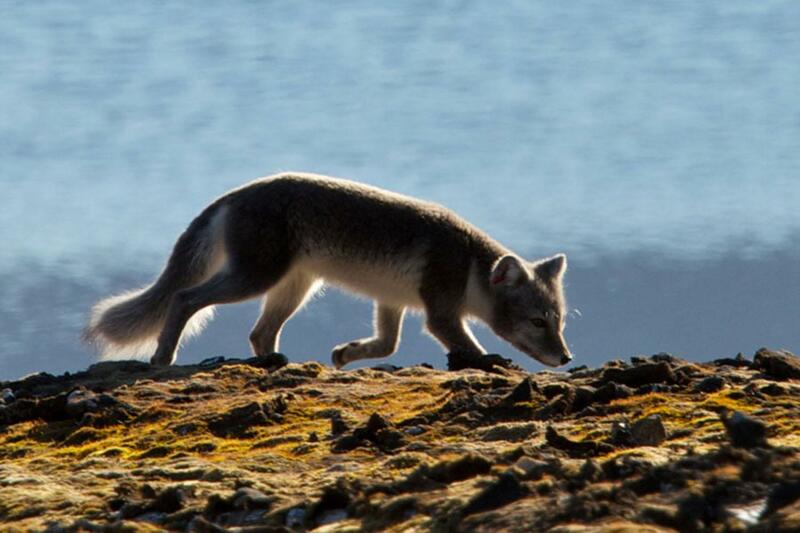 Here there are seabirds nesting on cliffs with Arctic foxes searching the base for fallen eggs and chicks. Meanwhile we hope to see Svalbard reindeer grazing on the relatively luxuriant vegetation. Day 11 - Longyearbyen We arrive in Longyearbyen and disembark in the morning to join our flight south to Oslo and thence home or perhaps spend a little more time around Longyearbyen. 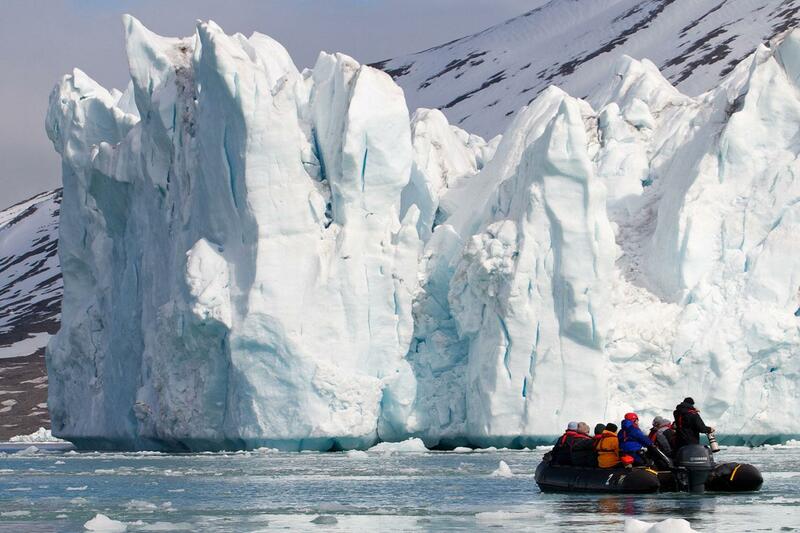 Board the M/S Sjøveien for a Svalbard journey of a lifetime. The M/S Sjøveien has been used as a hotel for the past few years and has now been completely renovated as a passenger ship, ready to set sail in the Svalbard archipelago. The key is in the detail of this stunning ship; with wooden decks and interiors, vintage elements and private bathrooms, one does not have to compromise on comfort while experiencing the icy waters of the Arctic. 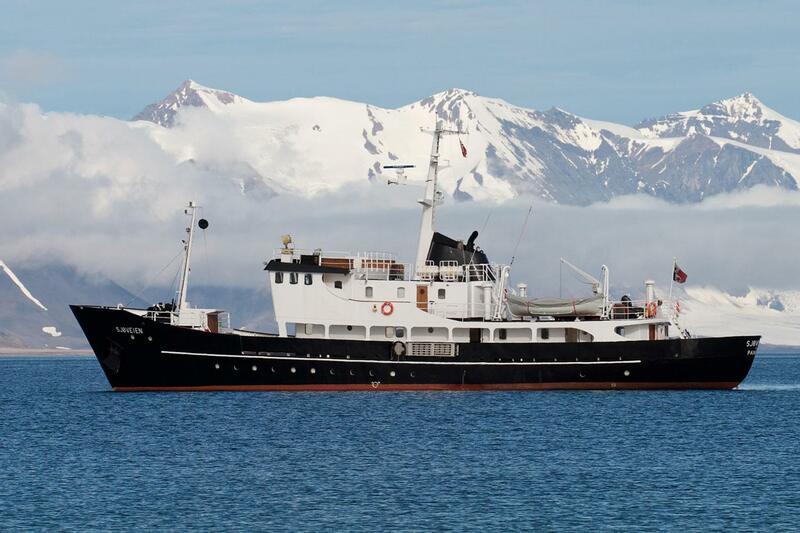 A more luxurious 12-passenger ship renovated with classic styling and necessary facilities for your Svalbard expedition. The M/S Sjøveien has been renovated with a range of accommodation options. Choose from twin and double rooms and upper and lower deck cabins with either windows or portholes. There is a large mess area, communal lounge and dining area where you will enjoy meals and lectures by your on-board guides. Dining aboard the M/S Sjøveien is an all-inclusive affair with breakfast, lunch, dinner and tea and coffee being served each day. The M/S Sjøveien is certified with an ice class of 1C which means she is ice-strengthened and can deal with ice up to 40cm thick. Deposits Reservations require a deposit of US$1500 (or equivalent currency) at the time you receive a booking confirmation from Expeditions Online. A payment link will be sent to you and this may be paid by major credit card alternatively bank transfer. Bookings within 90 days of departure require full payment. Final Payments Balances are due 90 days prior to departure. Final payment can be made by calling us (final payment cannot be made online) and may be paid by major credit card (however subject to a 2% surcharge) or bank transfer. Cancellations All requests for cancellation must be received in writing to Expeditions Online. If it is necessary to cancel your arrangements, the following non-refundable charges will apply: - More than 150 days prior to departure: USD 500 per person - Between 149 and 90 days prior to departure: Full loss of deposit per person - Between 89 and 76 days prior to departure: 75% of tour cost per person - On or within 75 days prior to departure: No Refund We strongly recommend that you obtain adequate trip cancellation insurance! Booking Terms Please read carefully the General Booking Conditions for Expeditions Online. This voyage is operated by Adventure Associates and you additionally travel under their terms and conditions as the operator as well as of the Shipping Company/transport carrier. Details will be forwarded to you at the time of booking.